GRILL DIRECTIONS: In shallow nonmetal dish, combine teriyaki baste and glaze and orange juice; mix well. Add steak; turn to coat. Cover; refrigerate at least 4 hours to marinate, turning once. In medium saucepan, combine sweet potatoes and enough water to cover. Bring to a boil. Reduce heat to medium; cook 6 to 8 minutes or until almost tender. Drain; cool slightly. Alternately thread sweet potatoes, bell peppers and zucchini onto six 12 to 14-inch metal skewers. When ready to grill, oil grill rack. Remove steak from marinade; reserve marinade. 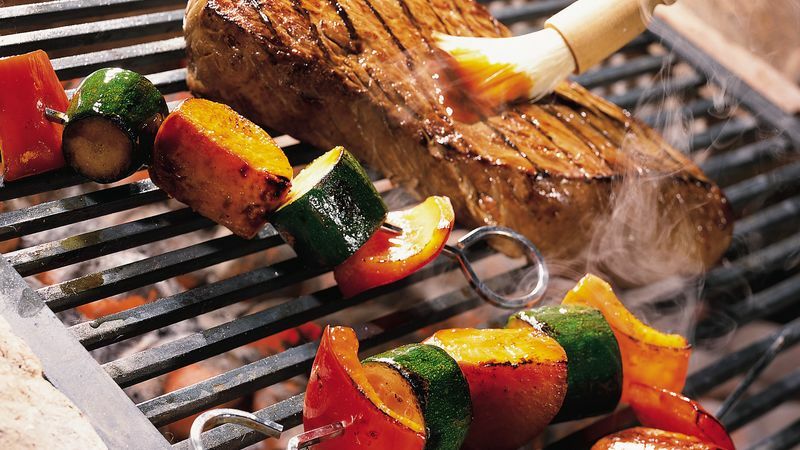 Place steak and kabobs on gas grill over medium heat or on charcoal grill 4 to 6 inches from medium coals. Cook 12 to 15 minutes or until steak is of desired doneness and vegetables are tender, turning and brushing steak and kabobs once or twice with reserved marinade. Discard any remaining marinade. Cut steak into six pieces; serve kabobs with steak. To broil steak, place on broiler pan; broil 4 to 6 inches from heat for 20 to 25 minutes, turning and brushing steak once or twice with reserved marinade. Place kabobs on broiler pan during last 12 to 15 minutes of broiling time; brush with reserved marinade.